'The oldest city of the world', 'the religious capital of India', 'the city of lights', 'Kashi', 'Benaras', call it by any name but you would be connecting to One- Gangadhar (Keeper of Ganga, name used for Lord Shiva) as Vishwanath (Lord of the World) in Varanasi. The city is the paramount worship place for Hindus among all the other holy cities where they can plan their tour to carve a way to salvation starting with the darshan of Vishwanath Temple. State of Uttar Pradesh is proud of its heritage, and Varanasi is part of this legacy with its unique culture and devotion to the Lord Shiva who is believed to be its founder. The name of the city finds its connection with the Rivers Varuna and Assi joining to form Varanasi. Many of the great scriptures, epics and works of art and music are credited to this place. Death is of special significance to the city of Lord Shiva, because here He is believed to have mandated cremation rites at all hours of a day, unlike anywhere else. This phenomenon might be unusual, though highlights death being only an indication of newer beginning. Spirit of Kashi is all about such philosophies and beliefs; Kashi which is more popularly known as Varanasi. Mark Twain once quoted about the antiquity of the city highlighting the inefficiency of the people to gauge its actual age. The city has served as a cradle to the languages, arts, culture, education and above all religion in the purest of form possible. Invaded and plundered again and again by numerous Turkish rulers the city rose to prominence after every act of destruction. Some of the names that highlight themselves in this anti-Hinduism act of demolishing centre of Hindu worship are Qutub-ud-Din Aibak, Feroz Shah and Sikander Lodhi. In stark contrast, Mughal King Akbar contributed in restoring the city to its earlier glory which was continued by Rajput and Maratha kings later despite Auranzeb’s anti-Hinduism attitude. Sant Kabirdas, Haridas and Tulsidas are also known for their contribution in terms of evolving the religious spirit through Bhakti Movement. In the British reign, Theosophical movement led by Annie Besant found its ground here. As a place for salvation from the hands of Lord Shiva. A visit in a lifetime is must. Kashi Vishvanath Temple: Also known as the Golden temple, it is among the 12 Jyotirlingas where Lord Shiva manifested himself for the convenience of the devotees. The site of the temple is said to be age old but the temple which pilgrims visit is constructed in 18th century under the supervision and contribution of Rani Ahilyabai Holker. 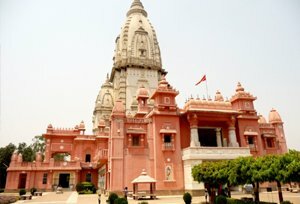 New Vishwanath Temple could be seen in the premises of Banaras Hindu University. The enthusiasm of pilgrims during the festival of Mahashivaratri is spell binding and thus not to be missed. Ganga Ghats: Assi Ghat, Hanuman Ghat, Harishchandra Ghat, Manikarnika Ghat, Dashaswamedh Ghat, Darbhanga Ghat, Kedar Ghat, man Mandir, Panchganga Ghat, Rana Ghat, are some of the main Ghats on the River Ganges where people bath, and two of them (Harishchandra and Manikarnika Ghats) are those where Hindu dead bodies are cremated. Each one of them has a story behind its construction and is unique in some respect, like Ganga Aarti at Assi Ghat is a daily ritual organized in a grand manner which brings locals as well as tourists-pilgrims in huge numbers; Alamgir mosque by Aurangzeb is present at Panch Ganga Ghat. 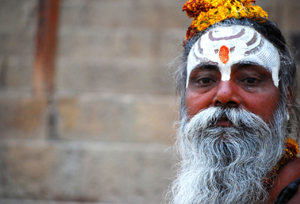 A pilgrim to Varanasi has the option of enjoy boating as well as walking to get immersed in their beauty and antiquity. Durga Temple: A holy person Narayana Dixit got the Durga Ghat constructed in 1772. Near the Ghat is a temple presided by Ashtabhujadhari (eight handed) deity and slaughterer of evil in the form of demons. The temple as conceived by a Bengali Queen came into existence in 18th century. Gyan Vapi Kup: Pilgrimage without a dose of enlightenment is not at all worth, which is why this place can open another door to enjoy Varanasi pilgrimage tourism. Meaning ‘Well of wisdom’, the Gyan Vapi Kup got constructed in 1828 AD by Rani of Gwalior Baizabai. Ramgarh Fort: This residence of Kings of Kashi was built in 17th century. Like many other prominent places of Varanasi, it is also located at the bank of the river. The museum inside the fort can be another curious aspect of the place. The fort in itself is highly revered by the locals and Shiva devotees, as they believe the kings to be the incarnation of Lord Shiva. Sarnath: Gautama Buddha who is believed to be the 9th incarnation of Lord Vishnu is known to have given his first sermon here making the place, some 20 Km away from Varanasi, highly revered. So people with varied religious curiosity and inertest can spend a great time here quenching their thirst of knowledge. By Air : Varanasi has a domestic airport which connects to Delhi, Mumbai and Agra. 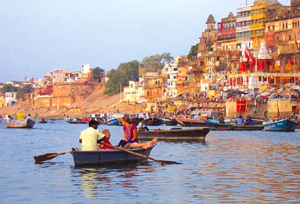 By Train : A major railhead, Varanasi is connected with most of the cities and towns of India. By Road : Frequent bus services from anywhere in UP can easily take pilgrims to their destination in Varanasi. Various routes connect the place with other states as well.